[0:02] <pzp> do you guys know of a nice USB Wifi Dongle I can get for my Pi? [0:02] <Sonny_Jim> Guy was like "Don't you want the box"
[0:05] <pzp> is there any spec I should check for? [0:06] <Sonny_Jim> Has anyone had any experience with the cheap chinese USB logic analysers you can buy off ebay? [0:08] <pzp> Davespice: should I go fro any bigger than 150mbs? [0:08] <pzp> or will i need a powered USB Hub then? [0:10] <Bozza> The more features the better right? [1:01] <pzp> btw does NOOBS and BerryBoot serve the same/similar purpose? [1:16] <pzp> arg why is no one here? [1:17] <pzp> so you can't use both simultaneously? [1:18] <pzp> theaftermath: do you recommend BerryBoot? [1:20] <theaftermath> did you just get your pi? [1:22] <theaftermath> welcome to the world of linux. there is usually something else that will do the job. [1:22] <pzp> but then i dont have a recovery mode do I? [1:22] <ozzzy> what do you want to recover? [1:23] <theaftermath> I'm not sure what the recovery mode accomplishes actually in those. maybe repairs the OS if you damage it. [1:24] <pzp> like Notepad for Microsoft maybe? [1:25] <theaftermath> a lot of flavors of linux are based on debian. [1:25] <theaftermath> plug in an ethernet. [1:26] <theaftermath> you won't be listening to pandora, writing a paper, and watching youtube at the same time. [1:26] <theaftermath> build a robot! [1:27] <ozzzy> pzp: you can't? [1:27] <pzp> but can you really listen to both? [1:28] <theaftermath> pzp how about a robot that uses your dog like a horse. [1:29] <theaftermath> you said original. LOL. are you familiiar with the command line? [2:43] <Triffid_Hunter> ponA: surely PHP has a join() function? [3:01] <Bozza> Is it possible to connect a psp screen to the pi? [3:03] <pksato> possible is. But, viable, I dont know. this screen have that type of interface? [3:06] <SpeedEvil> Bozza: yes, in principle - in practice you need signifciant understanding. [3:07] <Bozza> There would need to be some sort of converter? [3:08] <taza> Nah, you can have it work with just some clever wiring. Extremely clever wiring. [3:09] <taza> It's one of those questions where if you need to ask, you aren't skilled enough to do it. [3:10] <taza> You don't just take an off-the-shelf converter either, you'll need to build one. [3:15] <taza> Well I've been busy hacking stuff that I need over hacking hobby stuff, so not at the moment. [3:15] <Bozza> Sounds like a myth SpeedEvil? [3:16] <pksato> cellphone (not smartphone) use a simple serial controled LCD. [3:17] <taza> I needed to hack together drivers to repair my computer. Bleugh! [3:17] <Bozza> pksato: http://youtu.be/sDNxgR5WVMw what's the board this guy uses? [3:17] <pksato> display used on smartphones, games, tables, monidor are more complex interface. [3:18] <pksato> A cyclone II FPGA. [3:18] <SpeedEvil> yeah - that's not what I meant. [3:23] <pksato> or. some lcd controller can drive this display. [3:40] <Bozza> Is the main trouble converting serial to parallel ? [5:54] <ParkerR> Any ideas on why it wouldnt be? [10:14] <AHammar> Vialas, it seems that you are missing some library to compile libxml. Have you installed "libxml2-dev" ? [10:16] <Vialas> AHammar : "libxml2-dev is already the newest version." [10:26] <Coffe> have you tesed the suggestion in the error message ? [10:28] <Vialas> what would that be? [11:23] <gazzwi86> I was wondering if anyone could point me toward a good electronics case. I'm looking for something I could travel with and keep soldering iron, multimeter, resistors, RPi etc all inside. [11:47] <Davespice> gazzwi86: do you want it to be one of those flight cases with slotted foam? [12:05] <Ascavasaion> Hello all. 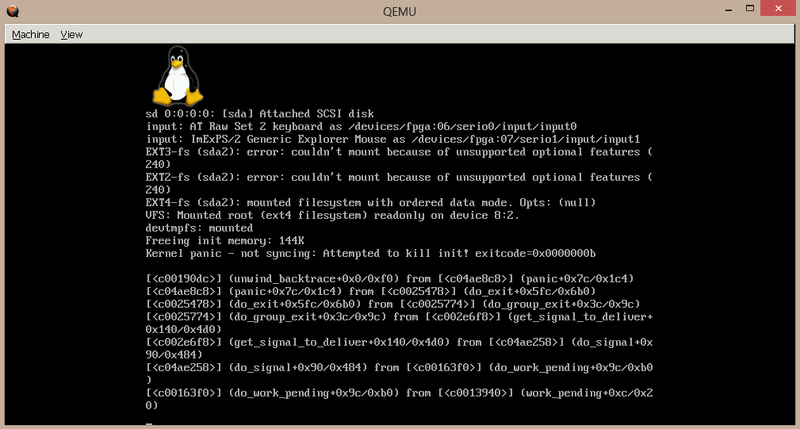 I am trying to install XBMC onto my Raspberry Pi. I have done http://www.raspbian.org/RaspbianXBMC and keep getting dependency problems. Is there no way to add it simply with an apt-get install? [12:06] <Davespice> Ascavasaion: do you really want to compile it yourself? there are some pre built image files that you can just download, burn onto an SD card and off you go? [12:08] <Ascavasaion> Davespice: Okay, cool. But I do not have an SD card reader. Could I use my digital camera as a SD reader? [12:09] <Davespice> are you on windows, mac or linux? [12:09] <Davespice> okay, so when you connect the camera does it have a device in /dev ? [12:09] <Ascavasaion> Let me see. [12:11] <Ascavasaion> Davespice: how would I check if it has an entry in /dev/? [12:12] <Ascavasaion> Davespice: Aaaah, okay. [12:13] <Ascavasaion> This Pi seems a bit advanced for my old brain. [12:14] <Ascavasaion> Davespice: Thinking more of the chuck it out thing, or give it to someone with a brain for this stuff. [12:15] <Davespice> are you on ubuntu? [12:15] <Ascavasaion> Davespice: I have battled for days on end just to install XBMC follwing the Howto, and I got nowhere. [12:19] <Ascavasaion> Pi is useless to me as it is anyway. [12:19] <Davespice> do you have GParted actually? [12:19] <Ascavasaion> Bought a Pi Dongle called a WiPi, and the thing crashed the Pi... someone told me the thing does not have enough power to run the Wifi Dongle. So why sell it without telling idiots like me that? [12:28] <Ascavasaion> Toodeloos all... think I wasted money on this Pi idea. It sounded promising, but has turned out to be a bit of a flop. [12:34] <Engen> Seen some of the home automation done with Pi's on youtube, fantastic stuff I say. [12:44] <[Saint]> Its a con! [12:47] <Davespice> [Saint] a con you say? that’s a little slanderous don't you think? care to elaborate? [12:48] <[Saint]> ...I knew I should've included some form of smiley to indicate humorous intent. [12:48] <TLoFP1> is this raspivid related? or is it as simple as the wifi breaking? [12:49] <Davespice> sounds like a memory leak hey? [12:49] <Davespice> TLoFP1: when you start the streaming can you run the top command on the Pi and see if the memory allocation to the video process just keeps growing and growing? [12:53] <Davespice> are you using gstreamer? [12:55] <ShadowJK> Yes, very interesting..
[14:22] <quetzakubica> Guys can you look at my app performance here http://46.171.50.94:8090 . It's django on gunicorn and nginx, deployed on RaspberryPi. Problem is that it takes 7s to load single html page. View is doing almost nothing. Debug toolbar is ON so you can check. In dev tools network panel you can see that waiting for response time is lot higher than CPU time. I have no idea why is this happening. On my local machine everything works fast. [14:40] <andreiiar> What is that? Does it hack my box? [15:13] <bluesm_> Plugin the 1Amp power source to Model "B" is perfectly ok Right ? [15:15] <zaggynl> hi, anyone here knows how to start a jnlp file over rdp? [15:16] <bluesm_> shiftplusone: What would be a difference if I plug 0,7 Amp or 1.2 Amp ? [15:16] <bluesm_> shiftplusone: Stability of current ? [15:17] <pksato> works and not works? [15:17] <shiftplusone> bluesm_, if the label is accurate, no difference at all. [15:18] <shiftplusone> you may run into trouble with the 0.7A supply if you plug in power hungry usb devices... but you would run into trouble with the 1.2A supply as well, maybe a little less though. [15:32] <shiftplusone> I suppose that's where all the java devs would've fled. [15:34] <shiftplusone> Oh, his email is getting some interesting subscriptions, yes. [15:35] <shiftplusone> Nuh, the postage fee is not worth it. [15:37] <quetzakubica> ShadowJK: what this wa means? [15:42] <quetzakubica> wa: Time spent waiting for IO. [15:46] <ShadowJK> you probably missing default gateway? [15:50] <coldjack> do you see any missings? [15:52] <pksato> 192.168.1.1 is ip of you router? can ping it? [15:54] <ShadowJK> output of "route" command? [16:00] <ShadowJK> does adress work as well as address? [16:05] <bluesm_> shiftplusone: So Pi not to much because "polyfuse" works only with current not more than 1,2 Amp, not to low because 0.7 could be not enough to power the PI and the mouse/keyboard ? [16:05] <shiftplusone> bluesm_, I am having trouble parsing the question. [16:07] <shiftplusone> Nothing to be sorry about, heh. Just re-phrase it. [16:09] <bluesm_> shiftplusone: So the "polyfuse" works between 0.7 and 1.2 Amp ? And therefore too low power means I will be not able to power Raspberry pi and mouse and keyboard with 0.7. And with 1.2 Amp I will destroy the "polyfuse" ? [16:10] <shiftplusone> bluesm_, nuh, that's not how it works. [16:10] <pksato> coldjack: you configured eth0 with static ip on /etc/networks/interfaces like you pasted code? [16:11] <shiftplusone> bluesm_, the polyfuse is there to protect the pi from devices which draw too much power, which may potentially damage the pi. You can use a 20A supply, if you can find one, that doesn't matter, the pi will only take as much as it needs. [16:14] <bluesm_> shiftplusone: So what will be wrong if you plu 20 Amp power source ? Nothing ? [16:15] <shiftplusone> bluesm_, nothing at all. [16:15] <shiftplusone> but good luck finding one. [16:16] <ShadowJK> coldjack; "address", noy "adress"
[16:17] <bluesm_> shiftplusone: So why on the Guide there is information : "This product shall only be connected to an external power supply rated ad 5V dc, and a maximuum current of 500-700mA for Model A and 700-1200mA for Model B. [16:18] <bluesm_> shiftplusone: They use word "maximum"
[16:19] <shiftplusone> bluesm_, it means that they recommend that you get a supply that can provide a current within those ranges. [17:23] <roidelapluie> any idea of how I can connect to it? [17:25] <quetzakubica> Guys I've made image of my sd card with rasbian. But Image has almost 16GB, while files takes only 4GB. How can I make smaller image? [17:26] <shiftplusone> There are no good practical ways. The simplest is to take a tar.gz backup of everything. [17:32] <chris_99> quetzakubica, theres a little trick you can do, if you fancy re-imaging it. Create a file, full of zeros, as big as possible on the RPi. (You can then delete it) Then take an image. Then compress the image. [17:33] <quetzakubica> if I backup everything, what then? [17:33] <shiftplusone> Then you have a backup of everything. What do you mean? How to recover? [17:34] <quetzakubica> I should install new rasbian on every sd card and just overwrite files? [17:34] <shiftplusone> I'd make a script to automate a backup and recovery of a card. [17:35] <quetzakubica> I have now configured Rasbian on SD card 16GB which takes 4GB. I would like to copy that Rasbian onto new SD cards with 8GB. [17:37] <shiftplusone> If you have to ask how, then it may be too much hassle for you. You understand the problem and you understand what you need to do. There are many ways to go about it, so pick whichever suits you and go from there. [17:37] <shiftplusone> you can shrink the partition, take a backup of both partitions and the partition table, then restore those. [17:37] <shiftplusone> you can forget that and copy the partition table across and then copy the files onto the partitions. [17:56] <steve_rox> anyone have any experence with the pir motion sensors? [18:03] <coldjack> what can be wrong, if i cannot login with ssh on my raspberry? [18:09] <Davespice> I can give you a simpler version of the code on my blog if thats any help? [18:11] <Davespice> so did you download and save pirDetect.py? [18:13] <Davespice> okay cool, then in another file called scare.py you include the file with the line "from pirDetect import *"
[18:13] <Davespice> have you got that? [18:15] <coldjack> how can i fix that? [18:28] <Davespice> ah okay, is that even with the sensitivity potentiomenter turned up to max? [18:29] <Davespice> so I presume it's not the Tandy one then? [18:38] <Davespice> is a terminal one? [18:39] <Davespice> anyone here know? [18:43] <Phosie> I've used irssi for about a year. [20:14] <steve_rox> you corrupt something? [20:15] <steve_rox> run fsck on it? [20:18] <kaszynek> Shouldn't there be any log from login? [20:18] <steve_rox> you did tell it to check all partitions? [20:22] <kaszynek> Can I mount it somehow? [20:24] <taza> Just google for "mounting disk image"
[20:25] <taza> Simply speaking, you're giving horrible advice here. [20:26] <taza> Sometimes it's better to admit you don't know the answer. [20:28] <taza> I'm trying to figure out what broke here. [20:28] <Bozza> Who knows a lot about wifi sticks? [20:31] <taza> ... as a scientific WAG, I'd guess it's trying to load something that doesn't exist, so you need to revert the changes it made. [20:31] <taza> Or set them to whatever the fresh image has. [20:32] <taza> Unpacking the Raspbian image to a SD card and then mounting the partition there is a known working way of reading the insides of the image. There are other ways, but I'm not feeling well enough to remember how to do those. [20:33] <taza> I remember it isn't that hard... but I can't remember much else. [20:37] <taza> Well, check your user folder, too. [20:38] <shiftplusone> Bozza, those sort of questions generally get ignored, even by people that may be able to help. The other day a guy was looking for archlinux experts, but his problem had nothing to do with archlinux and he could've had an answer sooner if he just asked the question. [20:40] <taza> I'm trying to remember if there's any way to run commands when you can't log in. [20:41] <shiftplusone> Bozza, fair enough. [20:45] <kaszynek> Probably it will be easier to do fresh install :? [20:45] <taza> Yeah, that's not unlikely. [20:46] <taza> I mean, you'd be restoring to a point where the system worked, then figuring out what went wrong. [20:53] <kaszynek> What other files does locale have? [20:53] <taza> ... I'm gonna ask you a question now. HOW were you changing bash to sh? [20:54] <taza> ... and how did you do it? [20:54] <taza> Didja change it back? [20:55] <taza> You have been rebooting, right? [20:59] <hydrospell> uh, anyone managed to use xmonad on raspberry pi - raspian to be exact? [21:33] <kaszynek> WebHome what options are you using? [21:34] <shiftplusone> looks like the xecdesign article then. [21:34] <shiftplusone> what's the output of 'file 2013-05-25-wheezy-raspbian.img' ? [21:35] <shiftplusone> could someone with 2013-05-25-wheezy-raspbian.img check? [21:37] <shiftplusone> WebHome, in the meantime try changing sda2 to sda3, sda4 and so on? They may have change the partition layout. [21:37] <shiftplusone> kieppie, looking to make your own or buy a pre-made thing? [21:41] <pksato> WebHome wrong kernel? [21:41] <shiftplusone> but I suppose my suggestion was stupid, since if the layout was wrong you would get "no init found" rather than what you're getting. [21:41] <WebHome> pksato: How so? [21:41] <shiftplusone> kieppie, I don't have any links handy, but there are some circuits that involve the use of a 555 timer to cut the power after the pi is shut down. [21:47] <shiftplusone> till a few issues to iron out, but I am just throwing ideas out there. [21:50] <IT_Sean> shiftplusone: Why not use a constant 12v source, then use the lighter socket to close a relay and start the Pi at startup, and as a trigger to perform a shutdown & time delayed power cut of the mraspi power when you switch off the engine? [21:50] <IT_Sean> Should be simple enough to make a small board that cuts power to the Pi X minutes after the engine os iff. [21:51] <IT_Sean> and there already boards out there that can do a safe shutdown and power cut to the Pi. [21:51] <kieppie> got any links, please? [21:52] <IT_Sean> Thats why i recommended a constant 12v supply to actually POWER the Pi. The very short amount of time the Pi will be on without the engine running would have nearly zero effect on the car battery. [21:53] <shiftplusone> IT_Sean, so instead of using a gpio pin to control the relay, use the ignition switch and then use gpio to tell the pi it's time to shut down? [21:54] <pksato> car dont have a power_on 12V line? [21:54] <spm_Draget> Anyone running arch in here willing to install >= cryptsetup 1.6 ? Could you paste the output of 'cryptsetup benchmark', thanks a lot. [21:54] <kieppie> oh - btw. does anyone know if LXC is working on RasPi/Raspbian? [21:54] <IT_Sean> The raspi on constant 12v. Power to the Pi is controlled by a smart relay board. when the car's switched 12v comes on, it allows the constant 12v to power the Pi. When the engine is turned off, the lighter socket will go dead, signaling the raspi to shutdown, and starting a 5 minute countdown, after which the constant 12v is cut. [21:55] <shiftplusone> spm_Draget, not many arch users here, #archlinux-arm might be better, but keep in mind that's not a pi channel. [21:55] <spm_Draget> I'll try, thanks. [21:55] <IT_Sean> That is how I would do it. [22:00] <shiftplusone> Would he need to dig through the service manual to find the best place to tap the constant 12v or is there some standard way to do that? [22:05] <shiftplusone> and I suppose some points would get cut while the engine starts, so that's something to avoid. [22:09] <IT_Sean> 90s / early 00es american cars often put them at the left end of the dashboard (you have to have the front left door open to find them). Many european cars have them in the engine compartment. [22:10] <IT_Sean> Most jeeps have their fuseboxes under the dash on the right (LHD: passanger side. RHD: driver side) side of the car. [22:14] <IT_Sean> And lastly, i know if several cars that have them in the trunk (boot, for those of you on the wrong side of the pond). [23:06] <pksato> betz: If have mouting holes, is a Rev2 board. And if have a two usb ports, is a model B. [23:10] <pksato> rev 1 board. [23:10] <pksato> and, have a 256MB? [23:11] <pksato> This is a early production baord. I have one too. [23:20] <bts__> can every accessible GPIO pin be set to pull down? [23:37] <theaftermath> bts__ I'm pretty sure that the pull high/low column on the left means those pins have t those resistors on them. [23:43] <stevarino> anyone know of a good tutorial to figuring out transistors from a pi pov? [23:55] <theaftermath> its not any different from a pi than it is from any other device. You need to learn how transistors work. [23:56] <theaftermath> then atatching to a raspberry pi wil be very easy.